The Sun's Pauline Wong did a feature on KURUS, this telemovie I produced and couldn't stop talking about in the past few weeks. This one is interesting because you get to read about our teenage cast's points of view. I need to rectify a tiny little mistake I spotted in the article though. It was mentioned that Ming Jin the mentor was approached by both Aron Koh of Limkokwing Film Institute and Greenlight Pictures to make the film, which is slightly inaccurate because Ming Jin (and I) ARE Greenlight Pictures, the film was originally developed as a Greenlight Pictures production, a follow-up to our previous maiden telemovie project CINTA TIGA SEGI (which was aired on TV a few weeks ago), before we (Greenlight Pictures) were approached by Aron, where he proposed that we join forces with Limkokwing University to make the film. And I have to say, the collaboration is definitely a fruitful one. KURUS (English title: DAYS OF THE TURQUOISE SKY) is coming out on NTV7 soon and stars Mislina Mustapha, Nam Ron, Carmen Soo, and newcomers Arshad Zamir, Anis Nadia Jilid, Ahmad Muzaffar Mustapha (no relation to Mislina), Muhammad Fadhirul Anuar and Nursyafiqa Izzaty. It will also have its festival premiere at the Hong Kong International Film Festival next month. 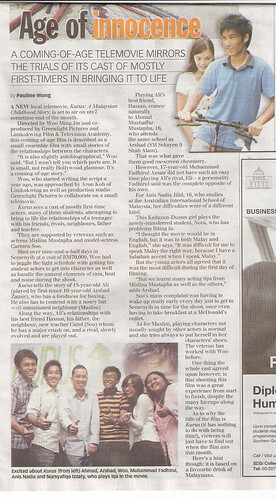 Read the film's previous write-ups on last week's New Sunday Times and Metro Harian.